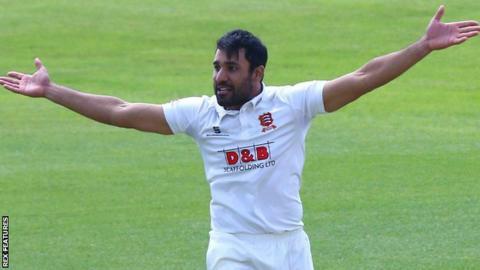 Essex all-rounder Ravi Bopara took a career best 5-49 as Derbyshire were forced to follow-on at Chelmsford. The visitors resumed on 124-2 but Bopara had Wayne Madsen and Tom Poynton caught behind, Hamish Rutherford caught at square leg and Matt Critchley trapped lbw to reduced them to 207-8. Tom Taylor (25) and Tony Palladino (24 not out) helped the away side to 280 all out, still 258 runs behind. Billy Godleman's 75 helped the host close on 150-1, still 108 runs behind. Derbyshire opener Chesney Hughes (26 not out) was forced off after feeling unwell while batting but is likely to bat tomorrow.